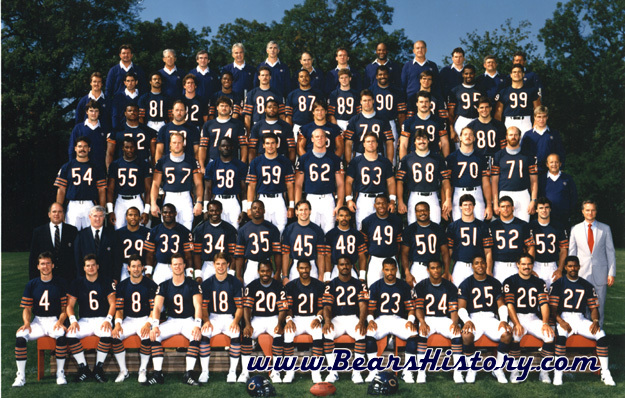 1986 Bears team photo. Jim McMahon and Kevin Butler are wearing black shoes, unlike most of the rest of their teammates. McMahon would don them later in the season to honor his friend Ken Margerum, who was unceremoneously cut by the team. Bears fans, and the nation, felt they were watching a dynasty in progress in 1986. The Bears were world champions of NFL football, and for much of the season, it looked like nothing would stand in their way of repeating for the forseeable future. In retrospect, it is easy to see that the egos that are built by championships certainly can do damage to an organization. All was well during training camp 1986, except possibly for the fact that QB Jim McMahon reported at over 220 pounds, evidence of the lifestyle he led in the offseason after the championship. The Bears had stolen RB Neal Anderson with the final pick of the first round, as they were able to draft for future need instead of the present. Anderson would use 1986 as a warmup-he would have huge shoes to fill 2 years down the road. In the 1986 opener on September 7, the Bears blew out Cleveland 41-31, in a game that featured the first use of instant-replay ever in an NFL game. This first use worked against Chicago, as a touchdown was awarded to the Browns on the ruling. The following week, new Philadelphia coach Buddy Ryan brought his Eagles to town for a grudgematch between the two bitter enemies Ditka and Ryan. The Bears prevailed in overtime, 13-10 in an emotional contest. Over the course of the next four weeks, Chicago dominated their opponents, with their defense on the way to an NFL record for fewest points allowed in a 16-game season. The Bears had won their first 12 games in 1985, and after the loss to Miami, won another 12 in a row including the playoffs. Fans began envisioning the possibility of another perfect season. But it was not to be, as the team lost a shocker to Minnesota, 20-7. Jim McMahon was injured again, and Steve Fuller just couldn't move the team. After the Minnesota loss, McMahon was back, and wore black high-top shoes as a tribute to WR Ken Margerum, a good friend of his who had been released by the club earlier that week. Chicago beat Detroit 13-7 with another impressive defensive effort. The following week, Chicago was shocked again, as the Los Angeles Rams beat them on a late field goal, 20-17. The talk of an undefeated season of just two weeks ago was gone, and many wondered how long the losing streak would last. More significantly in retrospect, WR Margerum's release two weeks before made room for the addition of QB Doug Flutie, acquired in a trade from the Rams. The trade for Flutie was highly controversial with Bears players-especially the QB's-who took it as an affront to their talent. Considering how much McMahon and Fuller were banged up, however, the move was almost a requirement for Bears management. After the two losses in three weeks, Chicago got back on track by winning at Tampa and Atlanta. On November 23rd, Green Bay was in town, and bad blood was still simmering from the '85 embarassments of the Packers. During the game, Green Bay defensive lineman Charles Martin body-slammed Jim McMahon in a clear cheap shot, and McMahon was lost for the year. With McMahon's loss went the Bears' hopes for a super bowl repeat. In the final four regular season games, all Chicago wins, Doug Flutie's playing time increased. Flutie possessed a rocket arm-but only stood 5' 8" tall-a dwarf by NFL QB standards. In addition to his size limitations, trying to teach a new QB Chicago's complicated offense in a few short weeks was suicide for the team. After the final four wins, Chicago finished 14-2, adding up to a remarkable two-year stretch record of 29-3. As a result, the Bears would face the Washington Redskins on January 3rd at Soldier Field. Washington was the NFC's wildcard team, but a tough one to beat given their 12-4 regular season record. The Bears entered the game as heavy favorites. During the bye week before the game, anxious fans wondered who Mike Ditka would choose to start at QB. Would he go with the experienced but unimpressive Mike Tomczak or Steve Fuller, or the newbie Flutie? In a move that divided the team, Ditka chose Flutie. Chicago began the game against the Redskins by scoring an early Flutie to Gualt TD pass, tying the score at 7-7. It was all downhill after that, however, and Chicago lost 27-13. The city was in depression, but felt the dynasty would still be alive in '87. First loss in 12 games. 2 losses in 3 weeks?? Passing: Mike Tomczak- The second-year free agent led a dismal field of backups that started most of the year. He threw for 1,105 yards for two touchdowns and ten interceptions. Rushing: Walter Payton- Payton turned in the final thousand yard season of his career with 1,333 yards on 321 carries, a 4.2 yard average. He also caught 37 passes for three scores. His offensive line should get some credit, as they may have been the best in the business at the time. Receiving: Willie Gault- Had 42 receptions for 818 yards and five touchdowns. If he had Jim McMahon throwing him the ball all season, the numbers would undoubtledy have been better. Scoring: Kevin Butler- Second-year kicker scored 120 points on 28/41 field goals and 36/37 extra points. Sacks: Richard Dent- Dent led the team for the third straight season with 11.5 sacks. Interceptions: Mike Richardson- Richardson's job became more difficult as he defended the opposition's best receiver each game. He grabbed seven interceptions on the year. Hard to list one starting quarterback, as the Bears opened games with four different players in 1986. Jim McMahon, the unquestioned #1, played in eight games. Steve Fuller five, Mike Tomczak, and newcomer Doug Flutie started and finished the finale against Dallas. He was also named the starter throughout the playoffs by Ditka, and lost the team's only appearance. Aside from the quarterback position, all starters remained the same from 1985 on both sides of the ball, with the exception of one wide receiver and cornerback spot. Keith Ortego played receiver and Reggie Phillips/Vestee Jackson split corner, due to season-ending injuries suffered by Dennis McKinnon and Leslie Frazier. It would be hard for anyone to argue that with a healthy team, the Chicago Bears would not have won another world championship in 1986. But they didn't, so the argument is really useless. Certainly the recurring injuries to Jim McMahon's knee and shoulder played a huge role in the team's inability to return to the Super Bowl (and made McMahon a quarterback that would never again play as he did prior to the '86 season). However, several other issues played as large a role as the sputtering offense behind revolving quarterbacks did. First of all were the distractions. Virtually every Chicago Bear could find side work in the hospitality business, commercials, radio shows and speaking engagements. Mike Ditka, Jim McMahon, Walter Payton, Mike Tomczak, Tom Thayer and others owned their own restaurants. Ditka pitched everything from cold medicine to car dealerships to hot dogs. McMahon, William Perry and others were the focus of national ad campaigns for fast food establishments. It has been well documented in several books on the subject that the off-field distractions played a part in the demise of a potential dynasty. Players envied others that received more attention (and money); even player's wives became competitive with each other. In a 2004 documentary, then General Manager Jerry Vainisi said he was very concerned about the team focusing too much on off-the-field issues, but with the Head Coach doing more endorsements than anyone, there wasn't much that could be done. In the same documentary, Ditka said "if you think I wasn't going to enjoy the fruits of my labor, you're crazy." Then there was the trade for quarterback Doug Flutie, the mother of all distractions. Ditka and Vanisi engineered the trade for the diminutive signal-caller, reportedly against the advice of President Michael McCaskey and personnel boss Bill Tobin. Ditka and Vainisi felt they had to shore up the quarterback situation with McMahon's recurring injuries, so they traded '87 draft picks for the 1984 Heisman Trophy winner from Boston College. The trade for Flutie did nothing but inflame the team, which felt to a man that Tomczak and Steve Fuller were capable of carrying the Bears to another Super Bowl. In the '86 draft, the Bears made a steal of a pick when halfback Neal Anderson from Florida was still available at the end of the first round. Obviously the heir apparent to Walter Payton, he would sit for the most of the '86 season but did score several touchdowns on long runs and receptions, proving his speed and skill. Other running backs selected before Anderson, who failed to accomplish what the Bears great did included Keith Byars, John L. Williams, Reggie Dupard and Ronnie Harmon. Following Buddy Ryan's departure to become Philadelphia's Head Coach, Vince Tobin, brother of personnel boss Bill Tobin, was hired as new defensive coordinator. Tobin brought in a mostly new staff, and former quarterback Greg Landry joined the offensive staff as quarterbacks coach. To the dismay of fans, Tobin favored a reading, finesse defense over Ryan's attacking "46". But the team still blitzed relentlessly and set an NFL record for the fewest points allowed in a 16-game season. 1985 holdouts Al Harris and Todd Bell returned to the team during training camp in '86. According to General Manager Jerry Vainisi, Bell signed for very little more than was being offered throughout his holdout in '85, making it fruitless for the player. Quarterback Jim McMahon showed the effects of partying during the offseason, entering training camp overweight, to the dismay of the coaching staff. McMahon said in a 1996 article that he "didn't think they made a calipers big enough to measure my body fat that year." The Bears and Dallas Cowboys traveled to London's Wimbley Stadium for the first American Bowl preseason game in 1986. Chicago won 17-6, and many British Bears fans were born as they gawked at players like Walter Payton and William "Refridgerator" Perry. McMahon started opening day versus Cleveland, and Chicago won 41-31 in a high-scoring affair. That game will be remembered for the first instant replay call in NFL History. The Bears began the season 6-0 before losing to Minnesota at the Metrodome, ending the team's winning streak at 12 games. Ironically they had also won 12 straight games in 1985 before losing to Miami. Following the trade for QB Doug Flutie, the Bears released popular six year veteran wide receiver Ken Margerum. He was a close friend of McMahon, leading to speculation that Michael McCaskey orchestrated the move to exact revenge for McMahon's criticism of McCaskey in his autobiography, published the previous offseason. The addition of Flutie polarized the locker room, with the vast majority of players upset at the coaching staff readying Flutie to play that season. Players felt he was ill-prepared to lead the veteran team, and coaches agreed that he was not equipped to win the playoff game against Washington. Tampa Bay pulls one of the, if not the, biggest draft day blunder in history. They select running back Bo Jackson with the first overall pick, and Jackson opts to play baseball instead of for the woeful Bucs. Tampa loses Jackson and never gets anything in return. The Bears are expected to dominate the NFL for years to come, and don't disappoint with a 14-2 record, still best in history for a championship team. Buddy Ryan takes over as head coach in Philadelphia but can only muster a 5-10-1 record in his rookie campaign. Chicago trades draft picks to the Los Angeles Rams for quarterback Doug Flutie, hero of the 1984 Boston College team. But Flutie can't learn the Bears' offense in time, and Chicago is shocked by Washington in the divisional playoff round. The New York Giants win the NFC crown, while Denver beats Cleveland on the road with "The Drive". The Giants win Super Bowl 21 39-20.